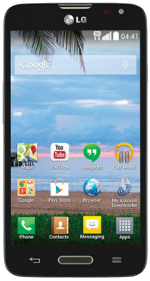 The LG Ultimate 2 is an Android smartphone that comes with a 4.5-inch display with 480x800 resolution and a 207ppi index. From within, it runs a 1.2GHz Dual-Core Qualcomm Snapdragon processor with 1GB of RAM and the Adreno 302 GPU. It has an internal storage of 8GB, with a microSD card slot for memory expansion by up to 32GB. The phone comes with a couple of cameras—a 1.3MP front-facing camera and a 5MP rear-facing camera with smile detection, autofocus and video recording. The phone runs on Android 4.4 KitKat OS, which makes it easy to download all your favorite apps and games. Available with a 2100mAh battery, the phone is able to last up to 12 hours of talk time and 9 days in standby mode.